* All teachers and ninth grade students are completing a survy based on the ISTE NETS standards so that we can gather some data on the impact of our iPad 1:1 program. 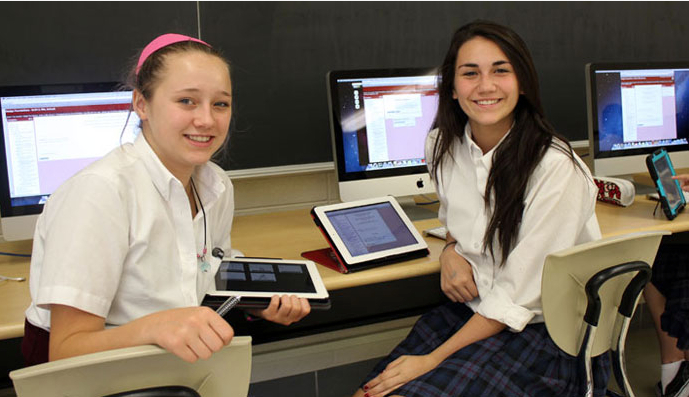 *Incoming ninth graders order their new iPads at the Mercy Site through June. * The IT Department will be preparing new MacBook Airs for Mercy teachers. These laptops will all contain iBooks Author software. * New ninth graders and transfers will begin receiving their new Mercy iPad packages. Mr. James and Mr. Bank will give them a 30 minute session with their new devices. * Mercy will be install a major wifi network upgrade that will significantly boost capacity and speed. It will support our Apple TVs now and our Technology Vision into the next years. *Mercy will get a major upgrade of our “old” computer lab. Brand new HP computers will replace the “old” ones and the lab will seat 25 students and 1 instructor just like our Mac Lab. CAD software will be loaded on these machines for our new design courses. All machines will have dual monitors. *Mercy will publish an iBook describing our innovative technology program. We are using technology in innovative and creative ways. We want our community to read about it, hear about it, and watch it in a new iBook. *The iWizards will lead our new students through a half-day iPad orientation. The program has been created by the iWizards. They have been working for months on the project! *Mercy will host a regional educational technology conference, showcasing and sharing best instructional technology practices. Mrs. Ann Lusch is taking the reigns of this project. Mercy High School is not resting on its laurels. We intend to continue as leaders in the field of instructional technology. — L. Baker, Apple Distinguished Educator. This entry was posted in Mercy 2.0, Updates and Upgrades. Bookmark the permalink. Love the plans! Great next steps! If you want me to write something up for the iBook, let me know.